I thought I was done with Henry’s fall/winter collection, but sneaking in at the end I made Henry a dapper holiday outfit since I chosen to be part of Pattern Anthology’s Winter Wonderland collection. 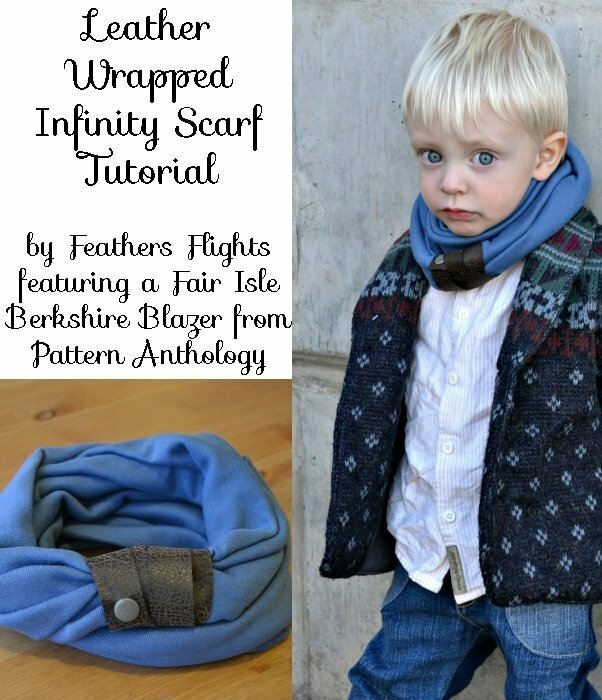 Along with his great outfit, I made a masculine infinity scarf with leather details. 1. Cut out your scarf. 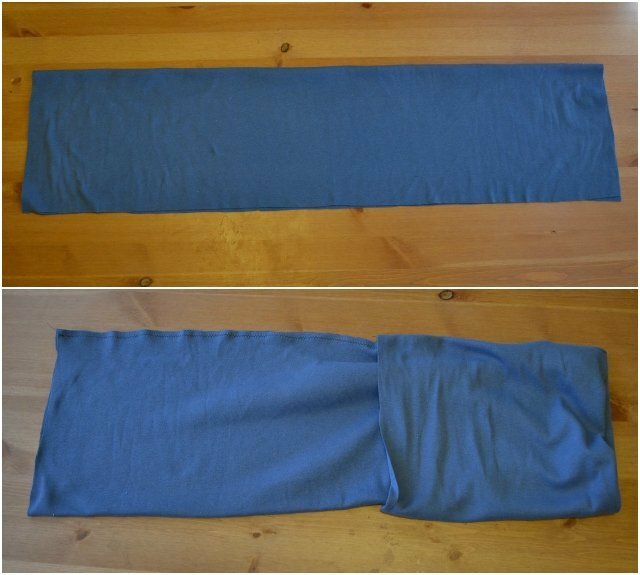 My scarf measured 36″x18″. 2. 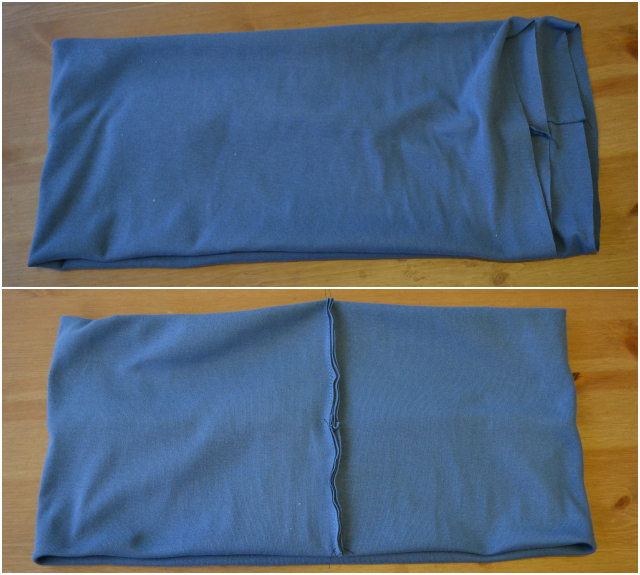 Fold lengthwise and sew along the long side. 4. Line up the two short edges with the seam in the center. 6. Cut a long strip of 1″ leather. 7. Scrunch up the seam enclosing the raw edges inside. 8. 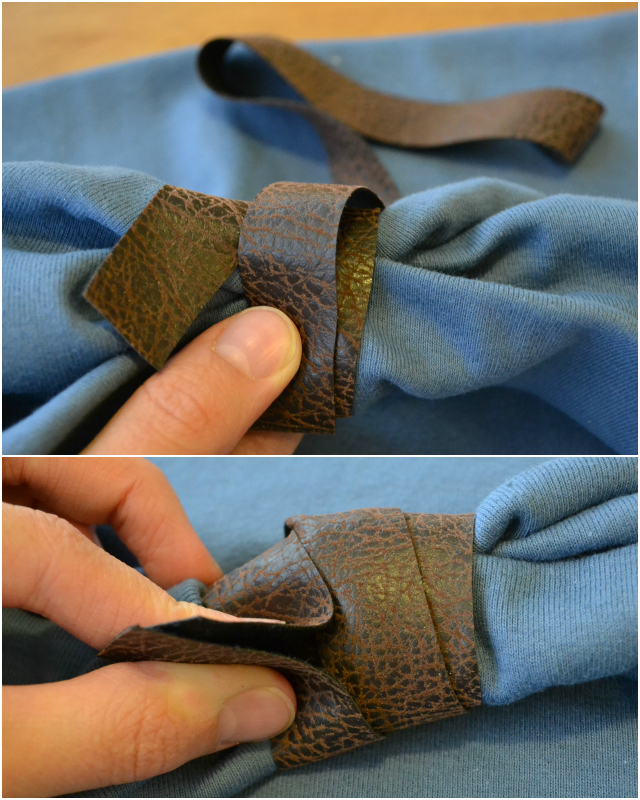 Wrap the leather around the seam enclosing it all. 9. 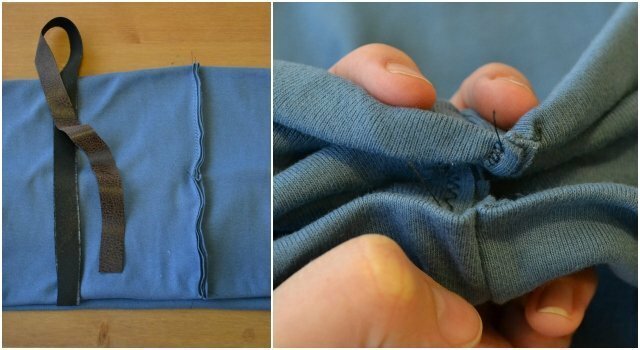 Sew the ends together or attach a snap for a cool look. 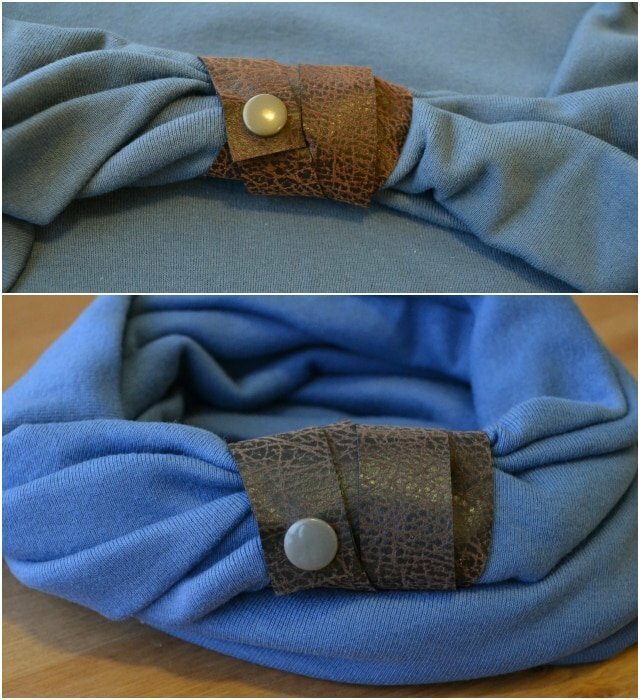 I love how the leather makes the scarf so easy to finish, dresses it up, and makes it masculine looking. It looks so great with his fair isle blazer! Now let’s talk about the pattern collection and the blazer I made. I was only able to make one pattern, the Berkshire Blazer designed by Melissa from Blank Slate Patterns. 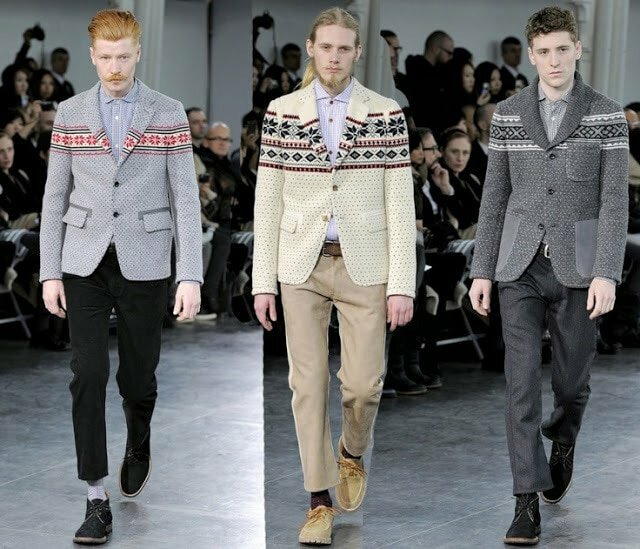 As I was looking around for inspiration, I came across these fair isle jackets. Aren’t they amazing!? I just had to make Henry a fair isle jacket. The only problem, where was I going to find fair isle fabric? After talking to Melissa and doing a lot of thinking, I decided to find a fair isle sweater and interface it well enough to turn it into a woven fabric. I searched thrift stores until I found the perfect sweater. I didn’t want it to be too busy, and it needed to be huge to have enough fabric to work with. Luckily, I found one that was perfect. Let’s talk about the Berkshire Blazer pattern. Basically, it’s amazing. I love that it’s a blazer for thicker fabrics. I mean, I used a thick sweater, and it still looks good! I think it’s warm enough for Henry to wear as a dressy coat. This is the first pattern I’ve sewn of Melissa’s, and she’s great at explaining the construction. I did have to play with the fit a little bit, but that’s because Henry is extremely tiny for his age. I would recommend using fabric recommended in the pattern if you have never put a jacket together to make it easier on yourself. I have made and altered many, many jackets, so I knew I could work with difficult fabric.I would definitely recommend this blazer to anyone wanting to make a nice jacket! I made the jeans using Titchy Thread’s Small Fry Skinny Jeans, and I made the bow tie using Delia’s crocheted bow tie tutorial. I even finished the jacket in time for Henry to wear it to a friend’s wedding last weekend. 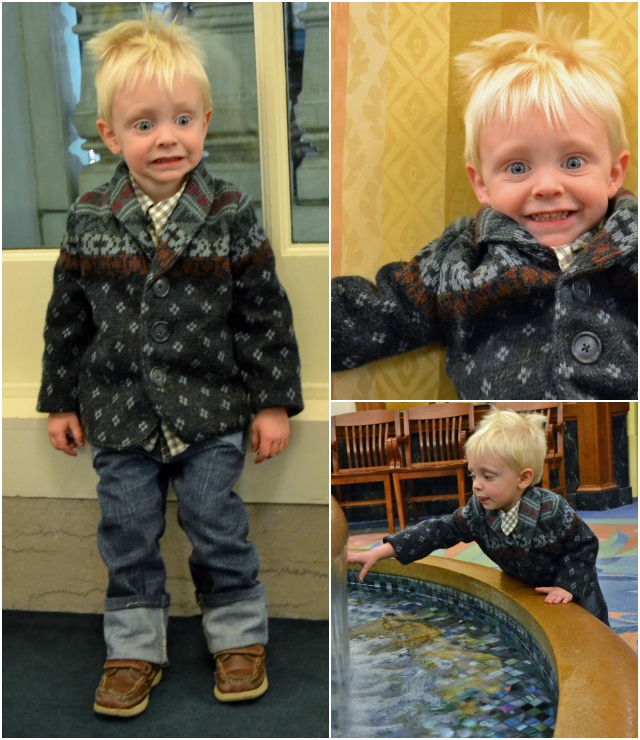 He got to stay up extra late but seemed to enjoy wearing his dapper jacket! 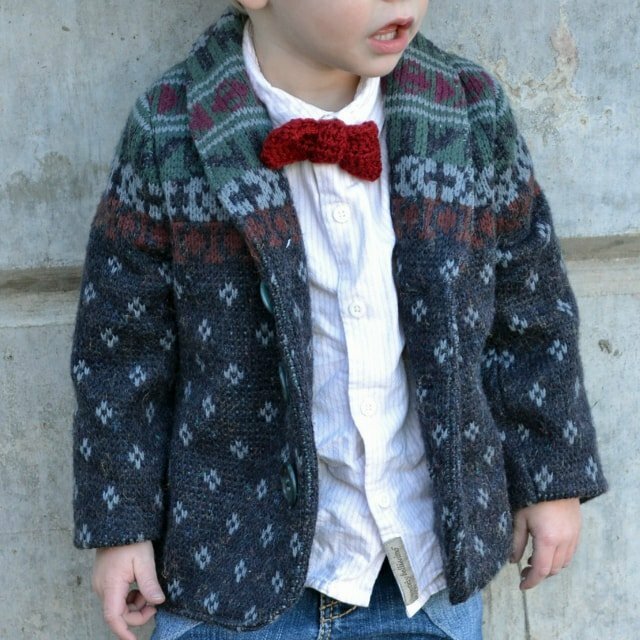 The jacket and bow tie will be his dressy outfit for the holidays.If you make something using this tutorial, I’d love to see! Please share it on social media with the hashtag #heatherhandmade and tag me! 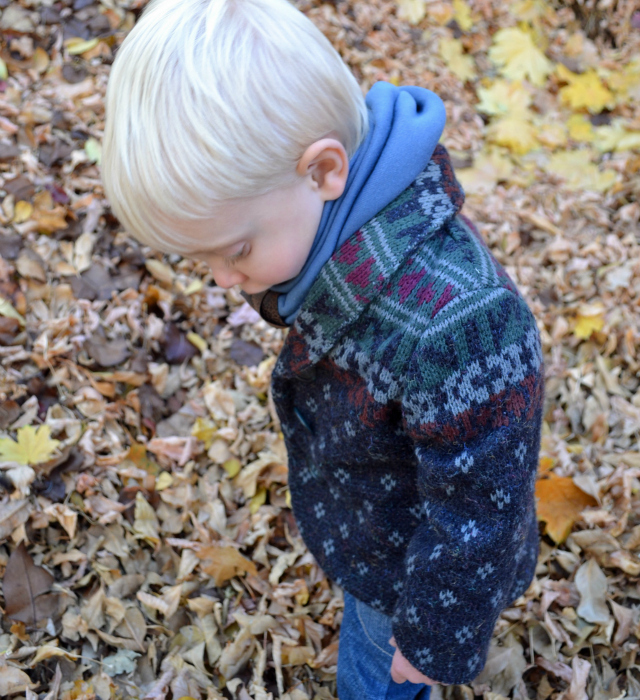 I love this blazer too…I want to make one for my grandson. Love how that blazer turned out! Just perfect! This is amazing–beautifully done! I love how you've managed to match up the pattern throughout the sleeves. 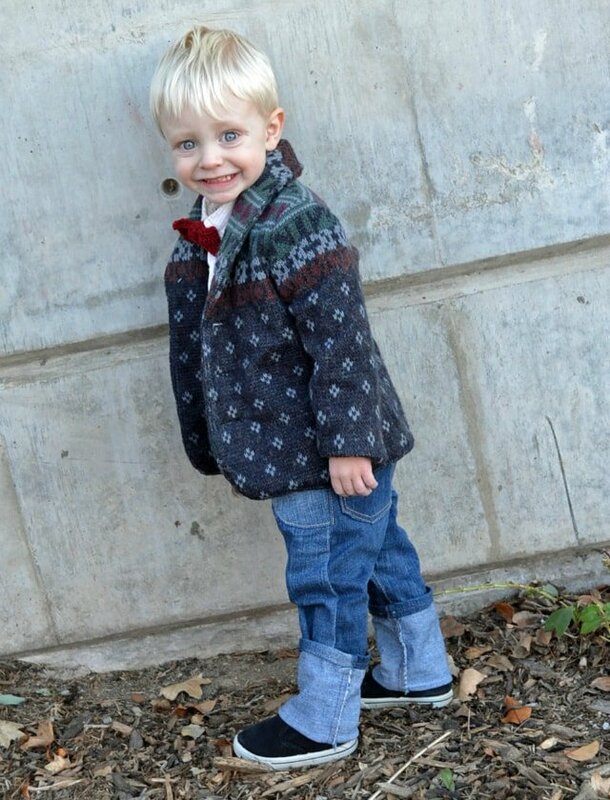 Fun fashion for little boys is a little tricky, but this look is too cute! that blazer is too cute!! thanks for being on the tour, your scarf is so creative! This is such a great idea for boys wear in the winter! Thank you for sharing! I just love everything about that blazer. It turned out perfect!!! I love the sweater to blazer and I LOVE that scarf so cool! love your blazer and what a fun detail on the scarf! Awesome job!!! Capital A Adorable!!! Cute, cute, cute! This is so clever…the blazer made from a sweater. What weight interfacing did you use? I love the scarf too. I've got lots of bits of ultrasuede and faux leather from the bags I've made. Can't wait to try this. 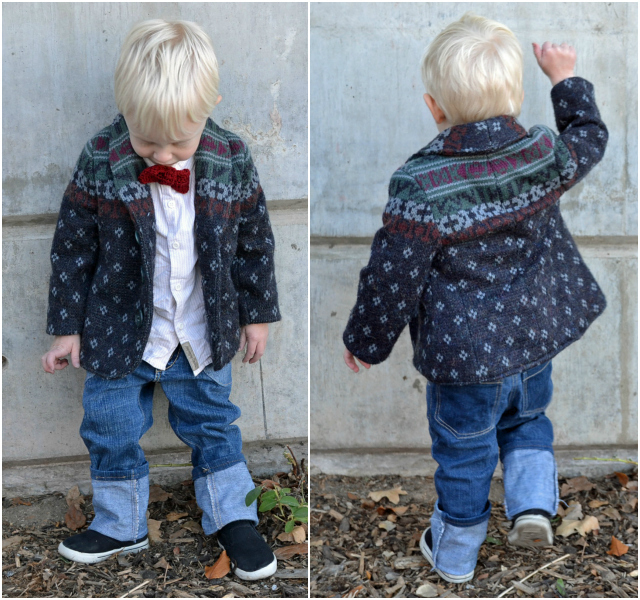 I love the blazer from a sweater refashion…so cool! I love the blazer! I always look to you (or Henry's wardrobe) for refashioning inspiration. I have been holding out on buying the pattern pack, absorbing all the inspiration. After seeing this look, I just purchased the pack and cannot wait to carve out some time to get started. This blazer is AMAZING! And the scarf tutorial is awesome! I need to make some of these. Oh, Heather, this is SO GREAT! First, love that touch of leather on the scarf….I always love those added touches for boy style. But the sweater-blazer (swazer?) is ridiculously cute. I love how you took an inspiration and just made it work. Perfect cozy, cute style! Love! Looks great. What a great little model you have. I love how it turned out Heather – definitely as good as your inspiration pieces! So, so cool. Thanks for being on the tour. At first I thought you just made a sweater, but then when I was looking at more pictures I could see the blazer. HOW COOL! You are like the most awesome mom ever! Thanks for sharing! I love your inspiration and you really brought it to life! Amazing. 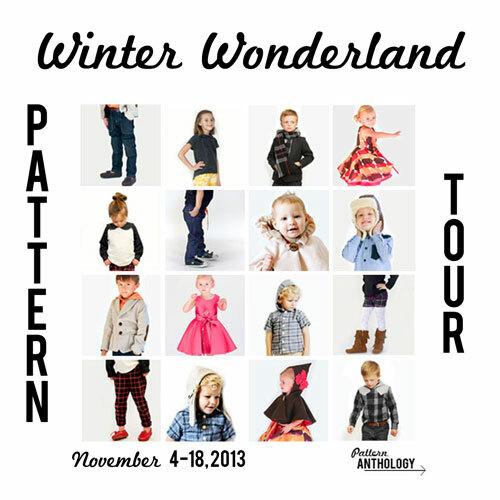 I'm jealous your little guy will wear scarves, what a great outfit all put together! This may well be one of the coolest blazers I've seen so far! 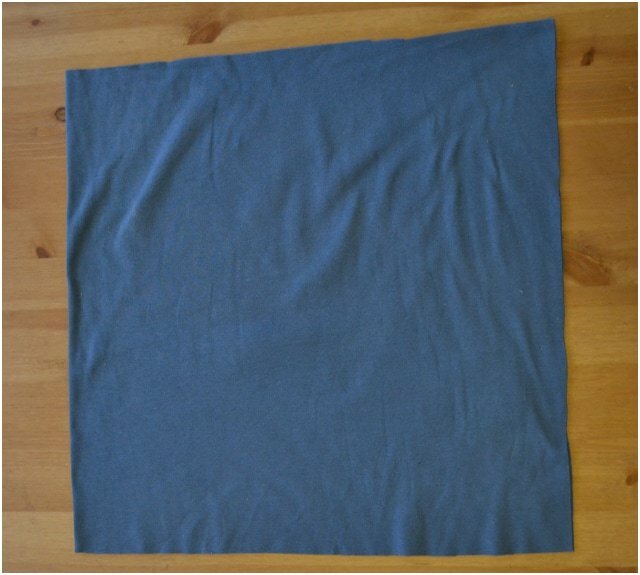 Great idea for a blazer fabric! looks comfy yet put together.